After work on Wednesday, I went flat-water kayaking at Harris Lake. It was pretty fun and not extremely strenuous. I wasn't as nervous as I was last year out on the lake and I think I even paddled better and figured out how to use the rudder to turn left or right easily. Jim took pictures!!! Next time we try kayaking, we'll start early in the morning and see how long it takes to cover the entire lake. 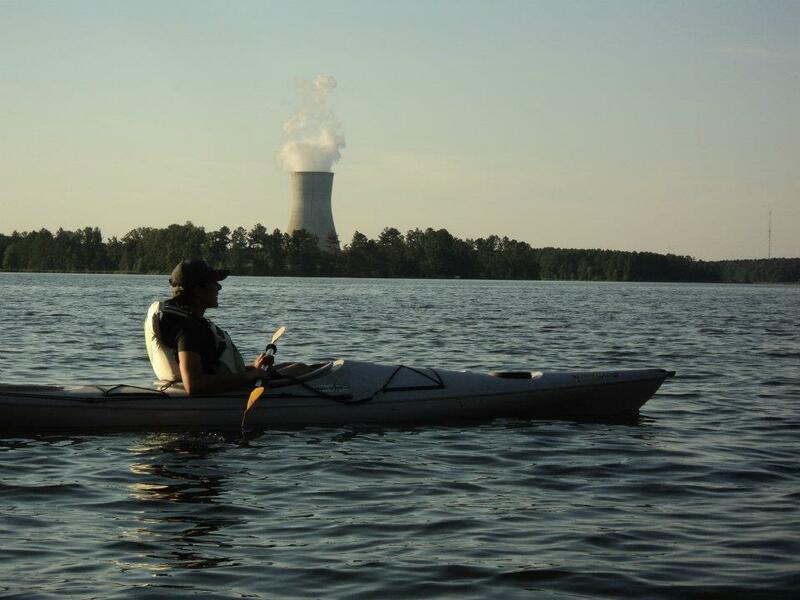 Harris Lake, so beautiful with your nuclear reactor cooling towers! At least I didn't see any 3-eyed fish out there. Thursday after work, I led an all-women's bike ride on the Harris Lake mountain bike trails. It was me and 4 other women. Two I already knew from my Tuesday night rides (Chris and Laura) and I met two new people (Wendy and Molly). Molly was a beginner and the rest were intermediate riders. So we did the beginner and intermediate loops and everyone was together for the advanced loop. That is when Molly decided to turn back (a little too hilly for her). Laura was super-nice and took her back for a couple more rounds on the intermediate and advanced loops. So then we were down to 3 and I did the advanced loop with Chris and Wendy. Both were good riders but when we went down one of the smaller drops, Chris hit her front brake too hard and I saw her rear wheel lift up and she flipped over the handlebars. She was okay but earned a fat lip for her efforts. I was really glad that she still got back on the bike and for the next 10 minutes we exchanged stories about our respective crashes. All the talking made me remember every single crash I ever had at Harris Lake (many!). I told her how I tried the little dirt jumps and caught air for the first time but then when I tried it again, I ended up coming down first on my front tire and getting catapulted off the bike. I still have a scar on my right shoulder from that fall!!! And then there was the first time I went on a TORC ride (at Harris Lake in April 2010) and managed to endo and the handlebars ended up bruising my torso. And then there was the time when I was following John and he was going a little slowly and when he turned I didn't see the tree and ended up catching the tree with right arm/shoulder. Yes, that hurt. Even more aggravatingly, I had been making efforts to get better at biking and that particular crash made me feel like I hadn't improved at all. Suffice it say, crashing is no fun but it has never made me want to quit mountain biking! I still love to bike and the accumulation of crashing, riding, and more riding and learning skills has made me a pretty good biker, maybe not great but pretty good.